Have you ever seen a small lizard in a garden? How about a giant lizard? 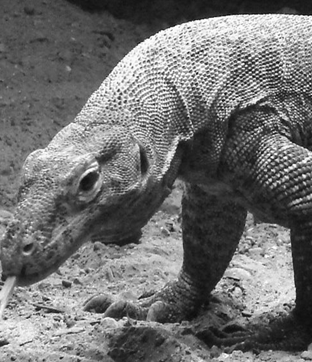 In the (1)_____, island country of Indonesia, there are between 4,000 and 5,000 giant lizards called Komodo dragons. They (2)_____ Komodo dragons because on of the five islands they live on is called Komodo Island. They are the largest species of lizard (3)_____. Adult Komodos are usually three meters long (4)_____ weigh about 70 kg. The (5)_____ Komodo ever was an amazing 166 kg! European scientists discovered (6)_____ in 1910, and when Hollywood producers heard about them they (7)_____ a movie about a giant gorilla called 'King Kong'. The Komodos live for about 40 to 50 years. They (8)_____ almost anything they can catch; for example, birds, bird eggs, monkeys, deer, and horses. Sometimes (9)_____ even eat other smaller Komodos, and sometimes (but not often) even people. They especially (10)_____ to eat dead and dying animals. There are only about 50 Komodo dragons around the world. (11)_____ there are so few of them living in the wild, a park called Komodo National Park was opened in Indonesia in 1980 to (12)_____ them.